Things are busy with writing my own papers and marking other people’s papers right now, so no saint went up last week. So today, since I have time on Sundays, last week’s saint will come up this week; whether this week will have its own saint remains to be seen. And on to our saint, a mystic, John Climacus (who is commemorated in the Eastern Orthodox Church today). St. John Climacus (c. 579-649 and thus a contemporary of St. Maximus the Confessor) was a monk of the monastery of Sinai, at the foot of the Mount of God, the mountain which Moses ascended and where the Lawgiver entered the Cloud, saw the back of YHWH, and received the Law of God, from which Moses descended with shining face from his encounter with the God of Abraham, Isaac, and Jacob. The spot is pregnant with meaning. At this monastery at the foot of Mt. Sinai, John, aged sixteen, took preference for the semi-eremitic life — a life halfway between the ‘total’ seclusion of the hermit/anchorite and the total community of the ‘coenobite’ (most Western monastics — e.g. Cistercians and Benedictines are ‘coenobites’ living in a coenobium). All three forms of monasticism were practised within the walls of this monastery, founded by Justinian (556-57). In this middle way, one pursues the monastic life of prayer and stillness under the supervision of an elder; John’s was one Abba Martyrius. Abba Martyrius, after John had demonstrated his worthiness over a few years of pursuing the monastic vocation, took John up the Mountain of God and had him tonsured, admitting him into the fullness of the monastic life. Shortly thereafter, Abba Martyrius died, and John pursued the life of the hermit, entering into seclusion to enter hesychia and the stillness of God’s presence. He retired to Tholas and spent 40 years there, admitting the occasional visitor who came for spiritual guidance. At the end of his 40-year stint he was elected to be abbot of the coenobitic community. In good monastic form, he resisted (one also typically resists being ordained priest or consecrated bishop if a monk), but was overcome by the brethren. He lived out the rest of his life as abbot of the monastery at Sinai. Whilst abbot, he wrote down his famous work Scala Paradisi, The Ladder of Paradise. As with our last mystic (Bonaventure here), it is not the exterior as found in these details but the interior that matters; it is the mystic’s encounter with God and the things of God that really matters. 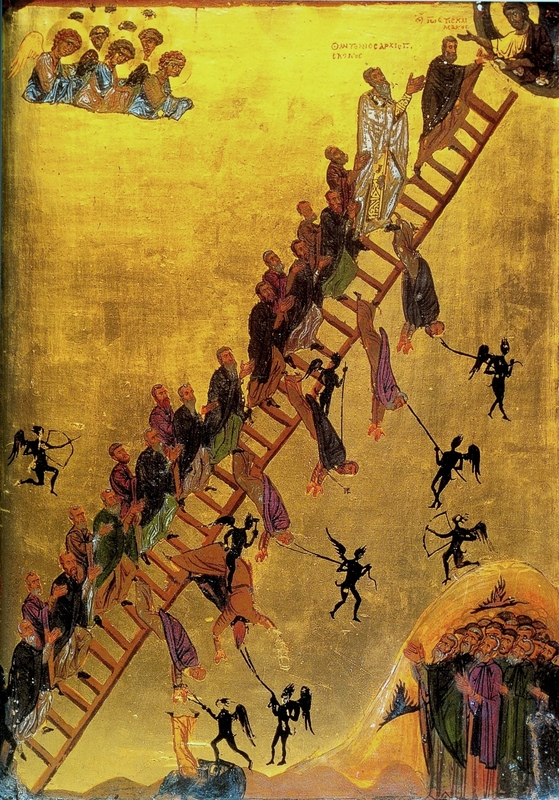 From John’s Ladder we learn of the ascent of the soul to God. As with many mystics, this ascent is gained through askesis, or asceticism, through the training and labours undertaken by the one seeking God in order to purify the soul/mind/heart so that union with God and the vision of God are possible, so that the contemplative can see Him clearly (though never in His fullness or essence, as God is ultimately incomprehensible). The thirty steps of the ladder’s ascent unto God are divided into three sections (this is also common, as we saw Bonaventure’s six levels divided by two into three; it is at least as old as Origen — cf. Andrew Louth, The Origins of the Christian Mystical Tradition 58-59). The first seven steps are about acquiring general virtues that are necessary for the ascetic life (cf. Origen’s ethike or ethics). These days, I think few Christians are inspired to climb any higher than these seven. I believe that we need to reclaim holiness and see a life beyond simple virtue. John Climacus can help. The second series of steps runs from 8 through 26. These nineteen steps are about even greater ascent in virtue as the ascetic learns to overcome the vices and acquire virtues in their place. Indeed, cultivation of virtue is the only way to fully extirpate vice and cleanse the soul so that we can draw near to God and theosis, deification. The final steps are the higher virtues. How many in our day even draw nigh to these virtues? I know not. I think they tend to be those imperturbable people who seem to radiate peace, calm, and a certain gentleness of spirit. They are also often wise. If you haven’t met such a person, it is your great loss. At the top of the ladder, we go beyond everything we do, everything we know. We encounter the living God. He is far beyond anything we could ask or imagine. And he alone is all we want and all we need.